I apologize for the quality of the photograph of our object this week, but the stitcher is on exhibit in our basement and the lighting there is poor. I hope the story makes up for the bad image. 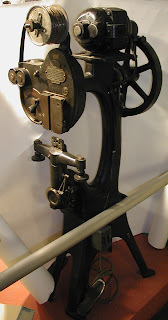 A wire stitching machine was used in the APH bindery to staple the spines of braille magazines, sheet music, and pamphlets. The machine feeds wire from a spool, cuts it, forms a staple, drives it, and folds over the points. An operator used foot pedals to control the action. Similar machines are still in use at APH every day although we also use an automatic stitcher/folder line too. We acquired our first wire stitcher around 1902 and purchased our first "Perfection" model in 1910, but we bought this one used. The Illinois Braille and Sightsaving School, now the Illinois School for the Visually Impaired, was a major producer of braille music scores before it closed its print shop in the summer of 1963. Most of the machinery in the shop was bought by APH and brought to Louisville later that year. This machine still has the state of Illinois inventory tag.